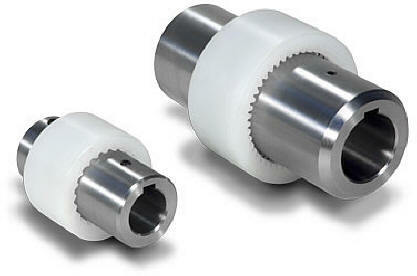 high speed gear coupling nylon teeth and steel bushing from Tramec s.r.l. GN Series - Elastomeric Coupling with Nylon Sleeve. GN Couplings are made from two crowned tooth steel gear bushings and are connected by a nylon sleeve with internal gear teeth. An internal sna[ ring in the center of the nylon sleeve prevents axial displacement. Our couplings are stocked in several standard sizes to match motor to reducers, and are excellent for transmitting moderate torques between motors and reducers at high speeds. The maximum temperature for GN Couplings is 158 F (70 C).